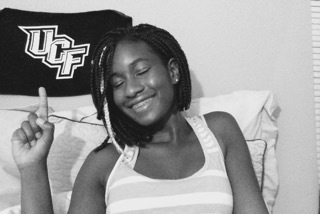 Check out our third Project Inspire Scholarship feature, Gabriella Pierre, currently a third-year student at University of Central Florida (UCF). Born and raised in South Florida, she is the first to go to college in her immediate family. When she first went to school and we found out she didn’t have her own laptop, we were able to quickly mobilize resources and ensure that this Gates Millennium Scholar had what she needed to be successful while on campus. We hope you enjoy learning more about this amazing first-generation college student, setting goals and reaching them throughout her college career! I’m currently involved in the Worship, Prayer, and Outreach Team of Chi Alpha Christian Fellowship, I am the Vice President of Gates Millennium Scholars of UCF, I am a member of the Student National Education Association, and I am also a proud member of the Nonprofit Knights. I volunteer at a number of activities on and off campus including volunteerism on the Youth & Mentoring team at the Orlando Day Nursery, serving as the Volunteer Coordinator for my church picnic, volunteerism at a number of church events, and also serving as a volunteer for Campus Outreach. My college experience has been nothing short of amazing! There are two major things I love about being in college (I can’t just choose one lol). One is the community of people that I’m surrounded by! They are like-minded and share similar goals so we support and motivate each other to live up to our best potential even in college. Secondly, is the opportunity. Man, the opportunities, even here at UCF are endless to grow and develop in your gifting and passions. There are so many opportunities to enjoy this season that I’m in. Thank you so much for giving to Project Inspire Scholars! You are such a tremendous blessing in my life and my fellow scholars! Financial needs can be such a burden on a student’s college experience and donors like yourself help alleviate that financial burden so we can focus on our school work and excel as college students! I can’t say thank you enough! Your giving is really appreciated and so helpful! Tags: College, Education, Inspiration, scholarship, youth. Bookmark the permalink.